CHARLESTOWN NEVIS (May 27, 2010) — The challenging situation of crime and violence which confronted St. Kitts and Nevis was the same in other parts of the Caribbean and worldwide. 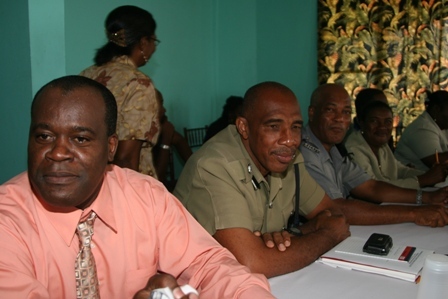 That view was expressed by Inspector Andre Mitchel of the Royal St. Kitts and Nevis Police Force, Nevis Division on Wednesday, at a Symposium on Crime hosted by the Nevis Island Administration. The Police Officer was at the time making a presentation on Anti-social Behaviour in our Society at the Pinneys Beach Hotel Conference Centre. “We hear of murders in Jamaica and kidnapping in Trinidad and Tobago and Guyana. In St. Kitts and Nevis we have experienced barring kidnapping, similar problems. Murder and other incidents of shooting, burglary and other breaking offences together with robbery and larceny have accounted for over 60 percent of our crime. Drug related offences have quietly accounted for an average of 20 percent of all crime over the past five years on Nevis,” he disclosed. According to Inspector Mitchel, statistical data from the Nevis Police Division for the past five years indicated that there were no incidents of murder in 2005; one in 2006, two in 2007, five in 2008, three in 2009 and four so far for 2010. All but three were as a result of gunshot injuries and haemorrhage and shock were common words seen on autopsy reports. In relation to breaking offences and those related to dishonesty he stated there were 183 out of 291 reported crimes in 2005; 179 out of 270 reports in 2006; 174 out of 284 in 2007; 196 out of 358 in 2008; 173 out of 334 reports in 2009. “The solvability of these crimes the picture is this: 48 percent in 2005; 50 percent in 2006; 45 percent in 2007; 46 percent in 2008; 36 percent in 2009 and so far in 2010 [it is] 55 percent. With the exception of 2009, Nevis enjoyed a fair detection rate with an average of 47 percent when compared with the international standard of 1 in 3 crimes or 33 percent. “These statistics reveal that breaking offences and the offence of murder have impacted us the most. It therefore means that any strategy aimed at reclaiming our society has to revolve around reducing the breaking offences and prevent murders from taking place,” he said. The Police Inspector indicated that based on their analysis, the breaking offences were perpetrated by male persons between the ages of 16 and 25 years. They were usually school drop outs, unemployed and products of single parent families. He said the offenders usually stole cash, jewellery and at times lap tops, cellular phones and television sets and the offence were committed mostly at nights between 9pm and 3am and in some instances during the day between 9am and 4pm. The motives for these offences, Officer Mitchel stated was twofold. The offenders used the cash to maintain themselves and their habits. In the case of stealing physical assets, a third party was involved in the form of a receiver, who offered minimum cash for expensive items. He said there had been situations where persons committed the offences of dishonesty in order to buy drugs for their use. In relation to the offence of murder, the Inspector explained that both the deceased and the offenders fell in the same age range as the other offences. “Even though some of the murders are not detected, our information and intelligence indicate that these offences fall in the same age range. Their profile is basically the same from a socio economic standpoint. Their behaviour is fuelled by the gang and drug trade. It is not surprising therefore, that 20 percent of all crime here on Nevis is drug related,” he said. In an effort to reclaim the society from breakers and drug related murders, Inspector Mitchel said the Federation’s Police Force had already launched its strategic Action Plan for the period 2009-2011 which outlined eight strategic objectives. The objectives were designed to reduce the incidence of minor and serious criminal offences, prevention of and reduction in gang related violence; reduction in the supply of and use of illicit firearms; reduction in supply and use of illicit drugs by 40 percent; enhance community and police relations; improve investigative and prosecution techniques; improve border control and security and to strengthen international and regional law enforcement cooperation.